This article would like to introduce 2 ways to convert PDF to webpage --- PDF to HTML and set image quality with GUI and CMD versions of PDF to HTML Converter in Windows platforms. On preferences panel, if you want to set image quality, please click tab “JPEG Quality” > drag sliding label there in order to adjust quality ratio flexibly, which helps you set quality of JPEG images. 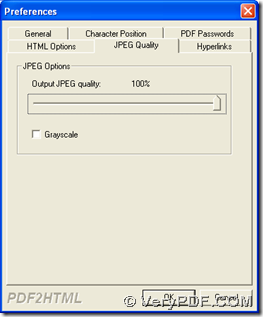 Of course, if you want to set your jpeg images as grayscale ones, please click check box of “Grayscale”, finally, you can click “ok” there so that this setting can be saved. When program take you back to GUI interface again, please click “File” > select “Open”, then a dialog box named “Open PDF Files” popped out, where you need to choose PDF file and click “open” in order to add PDF file for this process. And automatically, in another pop dialog box named “Save As”, you need to select targeting folder and click “save”, then after a while, this folder can be filled with another new webpage of HTML with the help of GUI version of PDF to HTML Converter. You need to open running environment of command line firstly: click “Windows + R” > input “cmd.exe” > click “ok”, a window called “command prompt” can be opened, which is operating environment in Windows systems. 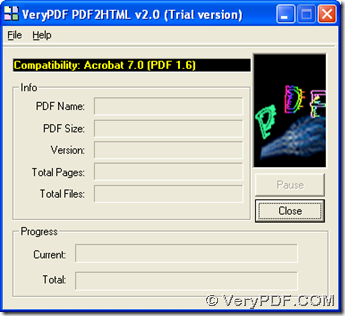 f:\pdf2html_cmd\pdf2html.exe is path of “pdf2html.exe”, which is typed for running CMD version of PDF to HTML Converer; –quality 100 is parameter with int “100”, which is inputted for editing quality of JPEG as 100, whose original parameter is “-quality <int>”; d:\in\example21.pdf is source path of PDF, which is typed for adding PDF for this process; f:\out\example21.htm is targeting path, which is used for saving HTML file; <enter> stands for one essential click on “enter” in command prompt window, which helps you start process. Finally, after you follow steps above to process task, you will find your webpage of HTML in targeting folder. How to convert encrypted PDF to HTML? This entry was posted in PDF to HTML Converter and tagged command line, pdf to html, PDF to webpage. Bookmark the permalink.